Every service your family dentist offers is available for your pets. Our focus at Animal Dentistry & Oral Surgery Specialists is to emphasize the services that improve comfort and eliminate pain for your pet. Improving esthetics (appearance) is a minor goal of our services. We offer a wide range of veterinary dental and oral surgery services to keep your pet companions feeling their best.Oral surgery represents the largest concentration of our pet dental cases. Consultation for the evaluation of occlusion (bite evaluation), tooth shape and number of adult teeth. 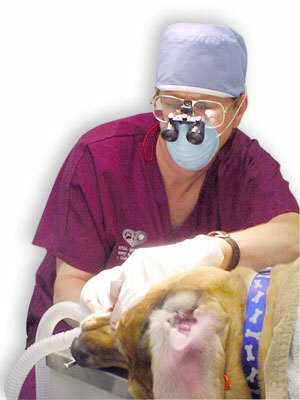 Animal oral or dental disease requiring diagnosis, treatment, prognosis and prevention. Evaluation for anomalous (abnormally developed) oral or dental structures and pet facial swellings (congenital cleft lip and palate, lymphatic, salivary and tooth anomalies such as enamel defects, enamel hypocalcification, hypomineralization or hypoplasia). Metabolic, neurologic, oral medicine ("rubber jaw", enamel hypocalcification, neuropraxia, neuromuscular disease) or related disease processes. Neoplasia diagnosis, staging, treatment and prognosis; (melanoma. fibrosarcoma, squamous cell carcinoma, osteosarcoma). At our Milwaukee facility, we work closely with Dr. Reiman (board certified medical oncologist) to treat animals with oral cancers. Infectious diseases of dog & cat oral and periodontal tissues, immune mediated conditions ("CUPS"- chronic ulcerative periodontal syndrome), and inflammatory (gingivitis, periodontitis,"LPGS" lymphocytic, plasmacitic gingivostomatitis' faucitis, "FORLS" feline odontoclastic resorptive lesions) disease processes. Pet oral and dental pain (discolored pet teeth or pet fractured teeth, excessive licking or salivation, and trismus or jaw clicking) management. Patients that not had pain relief and need help with a diagnosis and optimal treatment. Traumatic injury to a pet's mouth (animals hit by cars, trains, planes, baseball bats, golf clubs and balls and rocks) and difficulty in opening or closing the mouth (tooth luxation or avulsion, tooth discoloration or fracture, mandibular or maxillary fracture, symphyseal separation, "TMJ" ankylosis, fracture or luxation) tongue injury, mandibular or maxillary soft tissue "degloving" injury. Microscopic cytology, visual and tactile (periodontal probing) evaluations, digital veterinary dental imaging, computed tomography (CAT SCANs), magnetic resonance imaging (MRIs), rhinoscopy, exploratory surgery and related services (incisional and excisional biopsies for histology). Neoplasia or cancer surgical treatment (biopsy, "en bloc" soft tissue and bone resection, mandibulectomy and maxillectomy) this is also called surgical oncology. Oronasal and oroantral defect repair. Treatments for severe pet periodontal disease. Palate defect repair (for cleft lip and palate or trauma from sticks or gunshot). Amalgam oe composite restoration of cavities of molar teeth. Composite restoration of fractures and dental defects. Glass ionomer restoration of dental defects. Crown therapy to protect vital (living) and endodontically (non-living) treated teeth.